Despite the snow (and graupel), all other signs point towards an impending spring. Case in point: the American hazelnuts (Corylus americana) are now in bloom. Here you can see how both the male and female flowers are adapted for wind pollination. 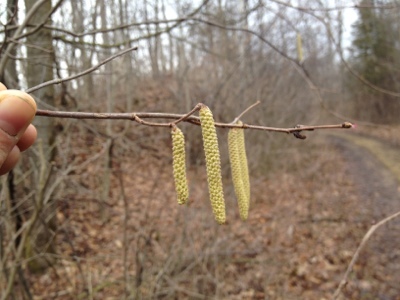 On the left of the picture you can see the long male catkins. They are designed to distribute lots of pollen in the wind. On the extreme right side of the branch is the female flower. All you can see are the bright pink stigma which are very exposed to any pollen that might be blowing in on the wind.